Whew! Doesn’t time fly when you’re working hard? April has zoomed by with lots of activity in the marina as boats prepare to leave for their summer cruising. We had a long list of get-gone jobs – transforming Emerald from her static winter state so that we can head off for our summer adventures and finally the weather was cooperating with a few days of light winds and sunny skies. One of the jobs on the list is the HEADPIPES. 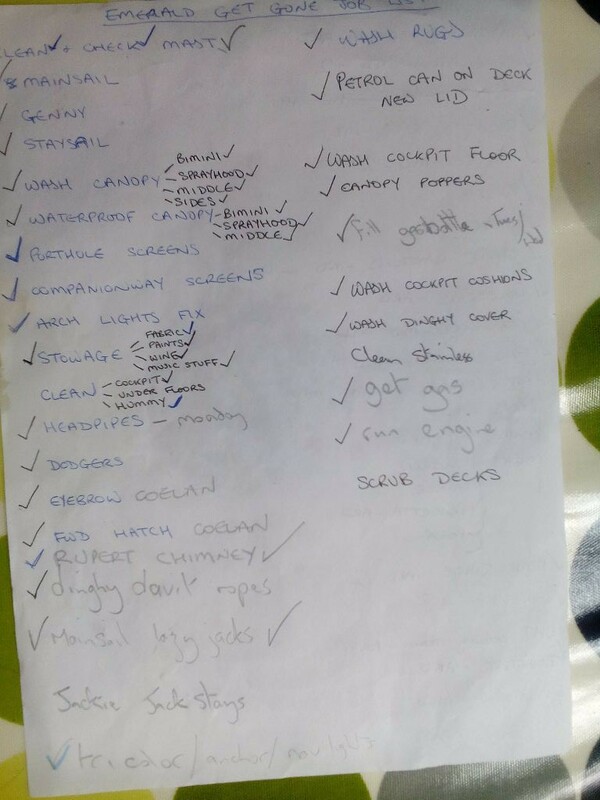 Otherwise known as Colin’s worst day of the year – the annual cleanout of the toilet pipes. We’ve found this pre-emptive strike to be effective in preventing unwelcome blockages at inconvenient times, especially as we only have one head now, having ripped out our aft head and converted it to storage. There was no putting it off any longer, so Colin bravely faced the yukky task. First off the seacock needs to be closed before the pipes and diverter valves can be removed. Surprisingly the pipes weren’t too clogged this year, but then we have been regularly flushing with vinegar. Most of the build up comes from calcification where the acids in urine react with salt water rather than other more unsavoury things that could be blocking the pipes. Some soaking and bashing of the plastic pipe frees most of calcium up, leaving the last stubborn cling-ons to be tackled with a scouring pad. The pipes and values are then put back together and the seacock serviced before its time for the first pump. How smooth it is now! Well done Colin on a successful end to his worst day of the year. And now he doesn’t have to do it again for another year (hopefully). After a winter in the marina Emerald was filthy. Despite regular rinses the decks were coated with sand and even inside the cockpit there was dust on every surface and the floor was getting close to being able to grow potatoes. 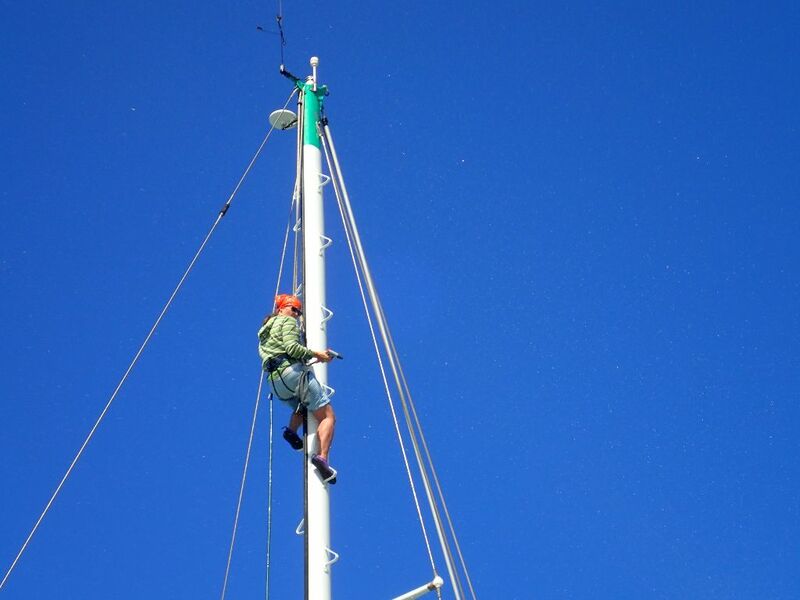 Several boats had left the marina before we’d even got our sails back on from their winter storage, but before we could do that we needed to clean the mast. 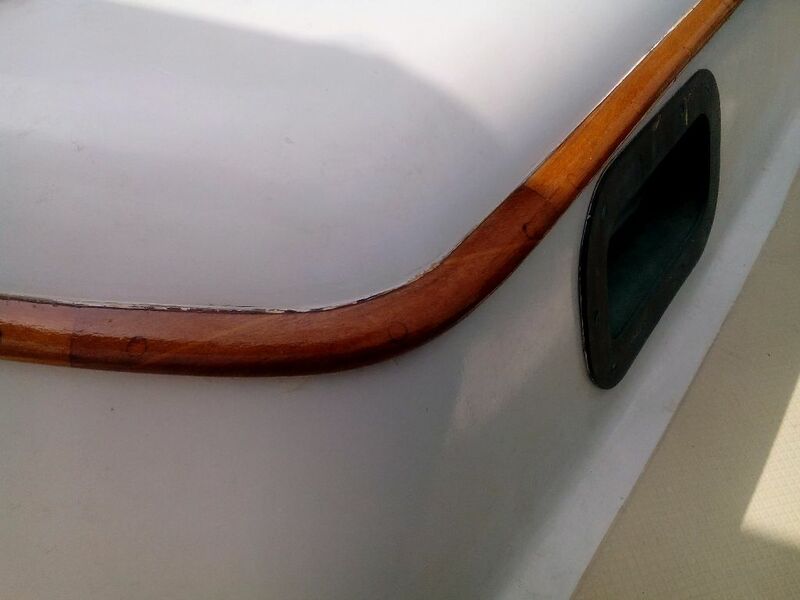 We’ve had a lot of sand blown in this winter and we wanted to make sure the mainsail track was clean as well as the blocks and lines as any sandy build up would cause friction and unnecessary wear. Then we could get the sails on and turn Emerald back into a sail boat. The sand had also left streaky orange marks in our canvas work. So off came the cockpit canopy for a good scrub and re-waterproof. We use Coelan on our external teak woodwork. It’s a flexible plastic coating which lasts longer in the sun than traditional varnish meaning we don’t need to be varnishing every year. However, Coelan does wear out and we’ve got into a cycle of renewing sections of woodwork each year as needed. This year it was the turn of the forward hatch surround and the eyebrow around the coachroof. I’d stripped off all the old stuff at the start of the winter expecting that we’d get a few days to paint on new coats. New product was ordered at the time in anticipation of getting it painted on soon as the coating doesn’t last very well in the heat and tends to go solid in it’s tin. Well the weather had other plans along with other unexpected demands on our time and it was only until last week that we were ready to begin painting. Over the winter the teak had weathered so the first job was sanding it back to the lovely orangey-brown, fresh teak colour. That job done we could mask up the surrounding paintwork ready to start with the primer coat. At which point I picked out the primer can from our paint supplies on board. Gave it a shake, but here was no liquidy sloshing noise. I gave the can a squeeze, it felt soft. Took off the lid, looked inside and could see there was definitely something in there. I tentatively tipped up the can and nothing came out. In the hope it was just a skin that was formed we gave the surface a poke with a pointy stick. It bounced off. The whole lot had gone solid. And you know what? This has happened to us before. 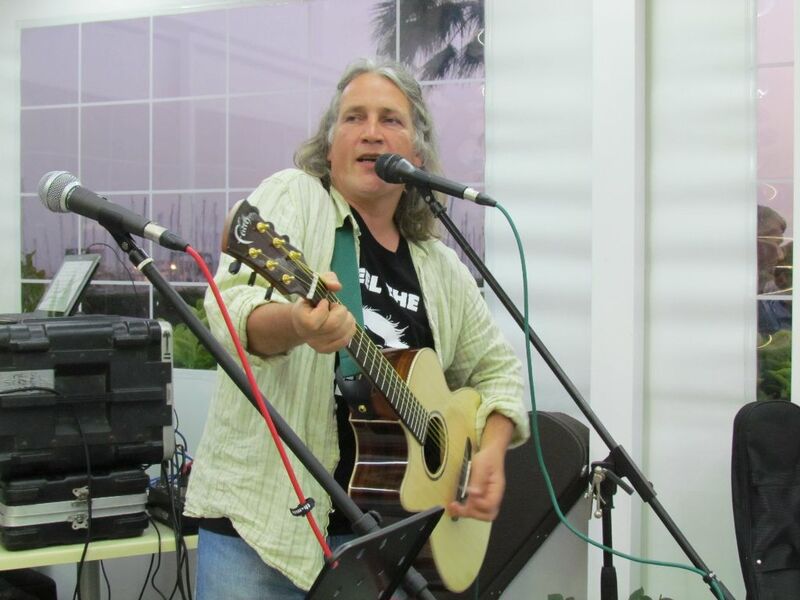 Way back in 2010; we even blogged about it! (Read here if interested). Such a shame we’d forgotten our lesson, maybe having happened twice it will stick in our heads this time and we’ll remember to check the primer tin as well as the coating before we’re about to start work! So a can of primer was put on order. We squeezed the two tins of Coelan coating we had and they seemed fairly squishy still. We didn’t want to risk opening them too soon as once air gets in it starts to set. The calm weather days passed with no arrival of the primer. One week, still nothing. 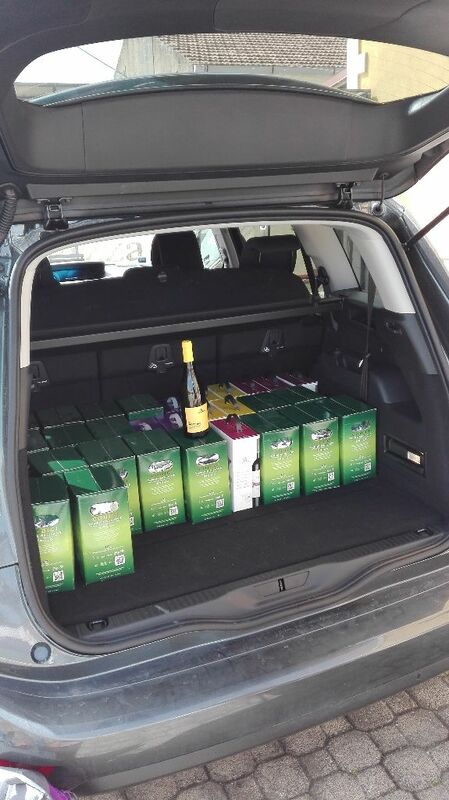 Contacted the supplier…. it hadn’t gone in the post yet! oh well, not a lot we could do but keep on waiting. Then finally it arrived, two weeks after ordering; masking tape went on and a coat of yellowy primer was soon gleaming away. Saturday morning was dry and calm, perfect for getting the first coat of Coelan on. We prised open the larger tin – only to find it was pretty solid. Yesterday’s optimism took a slump as the possibility we had no coating settled in. Turning to the smaller tin we opened it with baited breath….. not quite as flowing as it should be but better than the first tin. Luckily we had plenty of thinners too to help make it a bit more runny for painting. 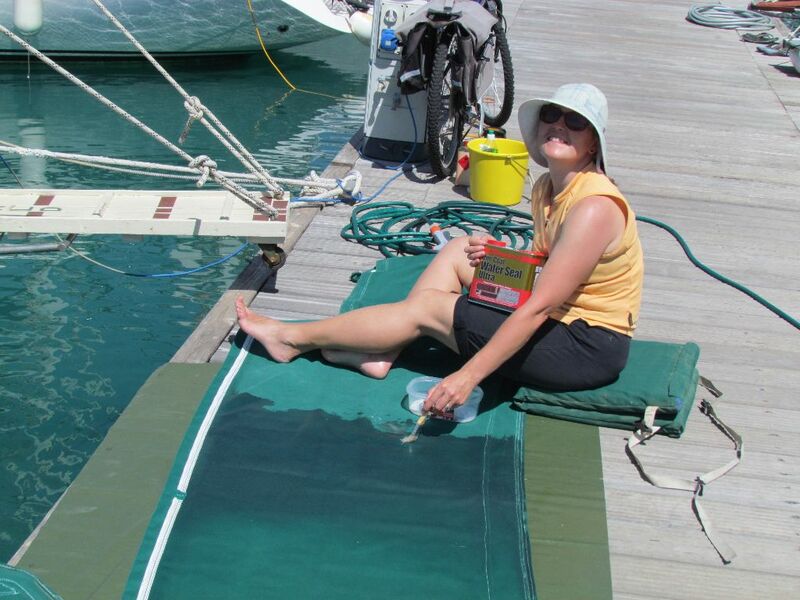 First priority was the foredeck hatch and getting the cracks sealed, then we could get on to the eyebrow. But it was a battle against time – the small quantities of Coelan I was decanting into a pot were setting in no time with gloopy lumps forming. I had to set my desire for it to look good aside and just get it painted on, lumps or not. On the positive side we’ve managed to eke out 8 coats and finished in a day and a half. 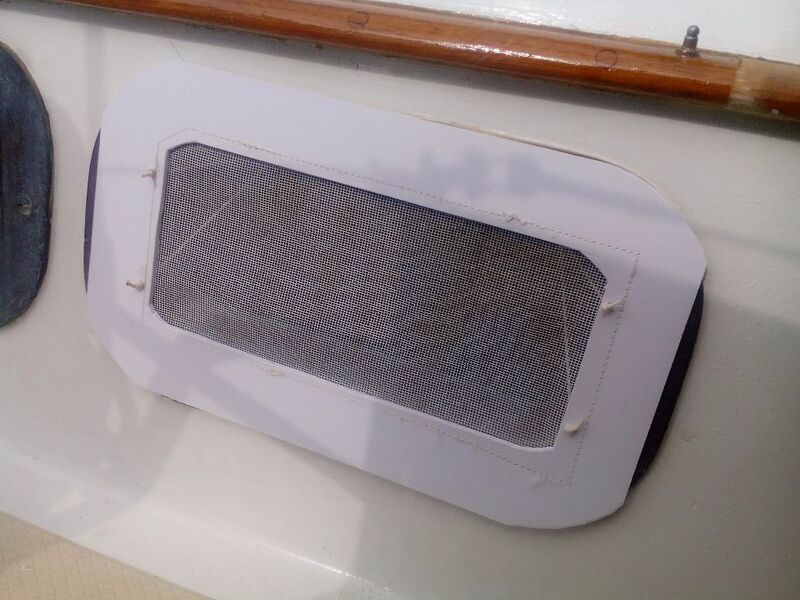 New companionway bug screens were needed too. The main one had a design flaw (we can say that as we designed it) and the wooden pole we used to keep it tucked in place would fall off and smack us on the head when we were going inside the boat. We still use the pole but the new version has more slack in the fabric so that it isn’t pulled so tight it pops out. If you saw some of the supplies we carried you might think we were heading off to outer space where there are no shops and no one needs food. We bought so much pasta in Portugal two years ago that we’ve only just finished it off this winter. 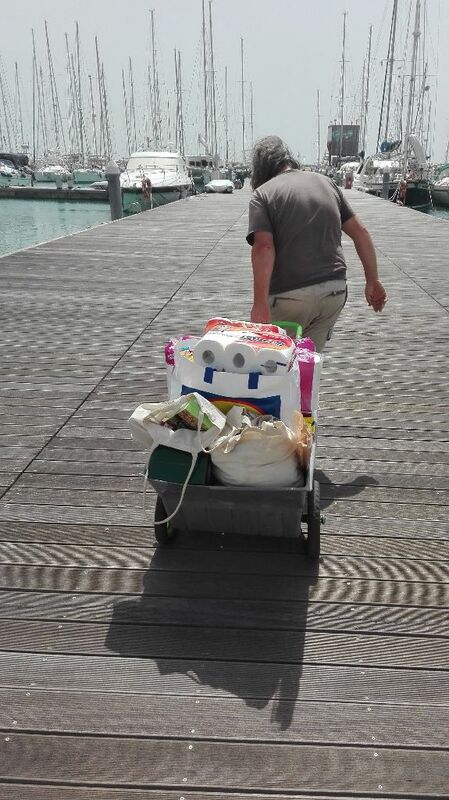 However, it’s so much easier to stock up on the heavy and bulky items whilst we’re still attached to land and don’t need to hump everything by dinghy. Stowing takes a surprisingly long time with older tins having to be brought out to have newer tins put underneath and secure places found for breakable items. Then we have to remember where we’ve put each item…. We still found time for some fun! 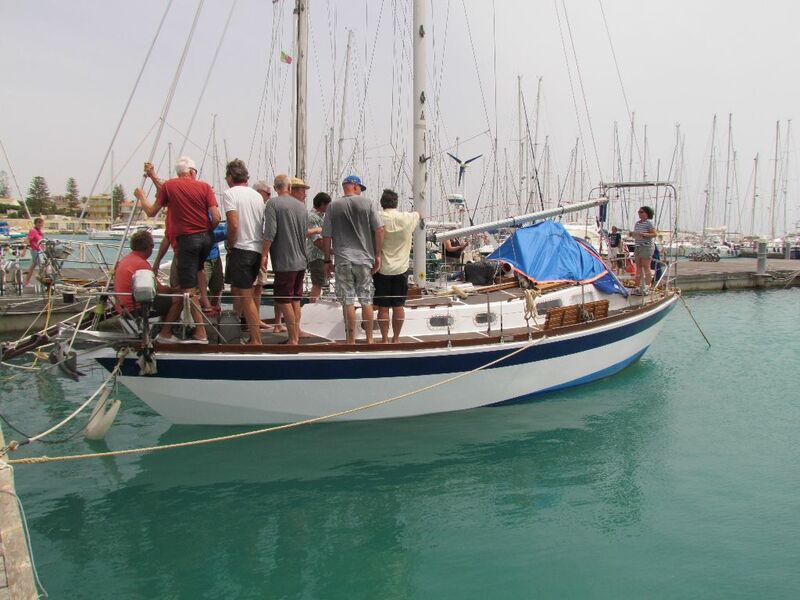 And to help out on other people’s boats – here’s what happened when a request went out on the morning radio net for as many people as possible to come and stand on the front of a boat. The aim was to tilt the boat so that the stern was raised out of the water – Ian could then access the end of the propeller shaft to fasten a bag around it. He would then be able to work on the shaft on the inside of the boat without too much water coming in. And it worked! How many sailors does it take to tilt a boat? How do you keep a bar full of rowdy sailors quiet? With difficulty, as the poor Commissario Montalbano (Inspector Montalbano) film crew found out. Montalbano is a Sicilian TV crime series that is filmed in the area – the crew were around in the autumn too and the ‘Montalbano house’ is just a few miles along the coast at Punta Seca. It’s shown on BBC4 for UK viewers. It was our usual Tuesday happy hour in the Stella Marina Bar, but this week the parking area outside was full up with film crew lorries and mobile dressing rooms. Just along the way the road was taped off where an episode of the show was being filmed in a house overlooking the marina. One of the film crew came along to the bar and asked if we could speak quieter as the sound equipment was picking up our noise. We tried but it didn’t take long before everyone was back to normal volume. They closed the doors of the bar; that didn’t work either. Finally someone was sent along who asked us all every so politely if we could on his word of ‘cameras rolling’ all stop talking for a minute or so. When he said ‘cut!’ we were all able to talk again and give a loud cheer. This happened a few times until finally they had their scene. 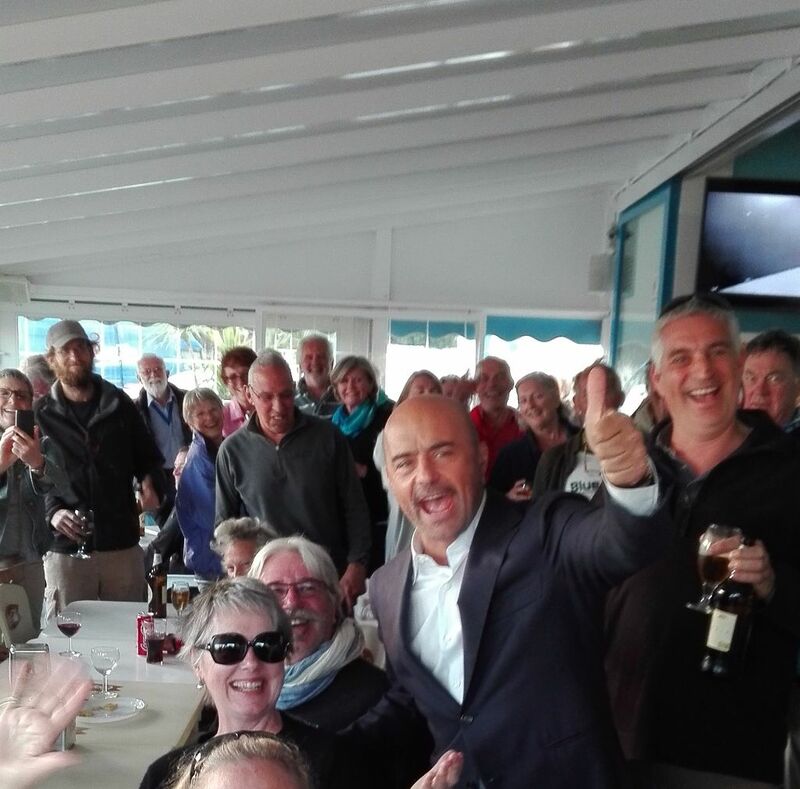 We’d all got back to our chat when there was a flurry of excitement inside the bar – Montalbano had come along himself to thank us all for our cooperation!